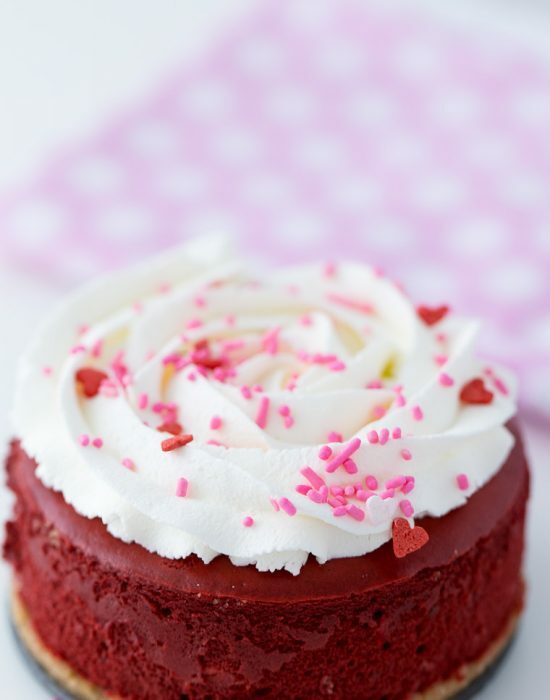 These chocolate strawberry cupcakes are perfect for your Valentine! Decadent dark chocolate cupcakes topped with a whipped fresh strawberry frosting. 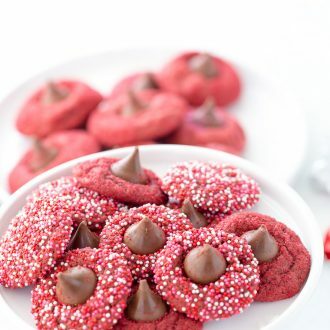 I have another new Valentine’s Day recipe for you today! 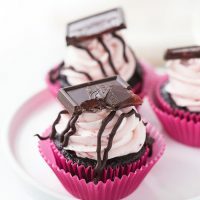 These chocolate strawberry cupcakes are new, decadent and a must for Valentine because who doesn’t like chocolate and strawberries? Right? But have you noticed that these cupcakes are not the only new things around here?? Blahnik Baker has a new look!! We got a new do by the lovely and talented Lindsay from Purr Design. A complete blog re-design has been on my to-do list for a long time and I finally decided to make it happen this year. I am so happy I did and I am absolutely in love with the new site. The new site is crisp, clean and very well laid out for easy accessing of ALL the recipes. 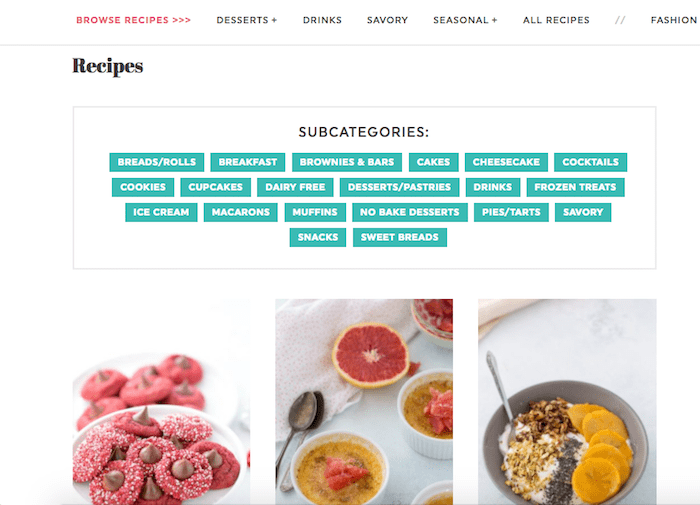 Starting with a brand new logo that I am in LOVE with, a new header with a focus on the different categories of the blog and a new recipe index for all the recipes. I have also created new landing pages for the Fashion and Lifestyle categories of the website. As you may know by now, I am a shoe-a-holic fashion enthusiast and would love to continue sharing more of that passion here. I hope you take the time to explore the new website a little bit and please feel free to let me know what you think in the comments. 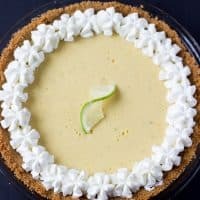 I want make sure you find everything easily, especially the mouth watering recipes. If you are a blogger and you have been thinking of a site re-design, DO IT!! I cannot recommend Lindsay enough. She is great to work with and puts to life your dream. 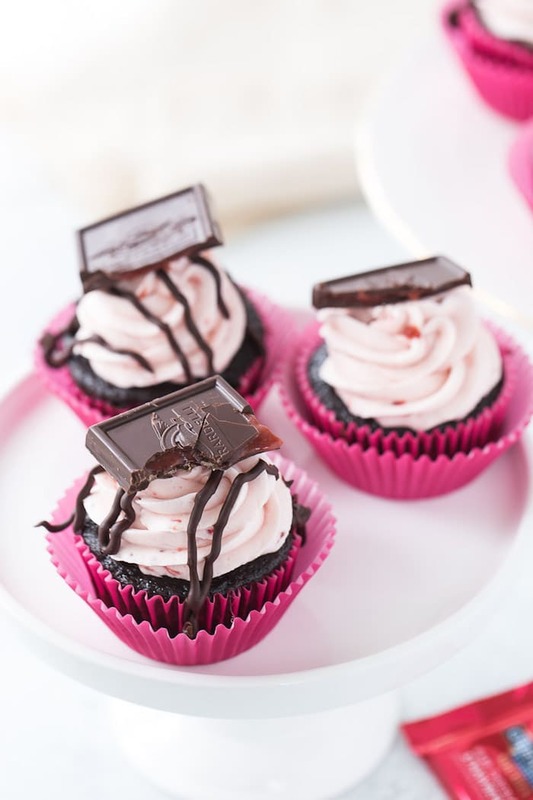 Okay, back to these chocolate strawberry cupcakes. They were actually inspired by these Ghiradelli chocolate squares with strawberry filling. My good friends at Ghirardelli sent me a Valentine’s Day package last week and I could not get enough of those squares. They are SO good. After one too many, I decided to make these cupcakes and use the squares as decorations. Because why not?? 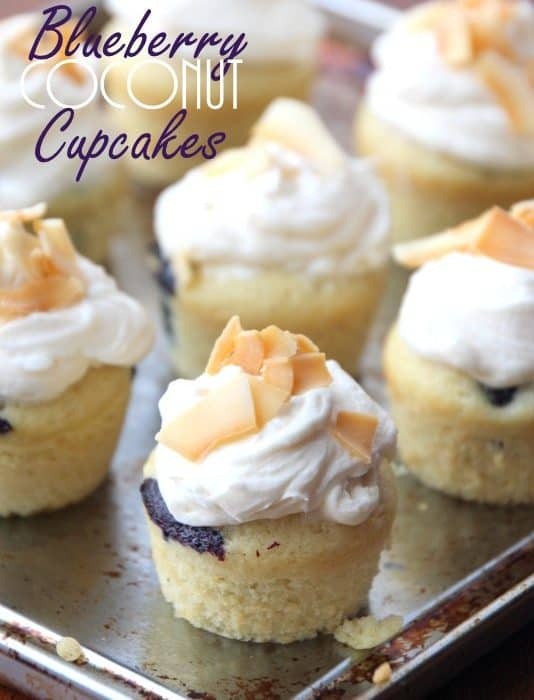 I hope you get to try these cupcakes soon! They are filled with all the chocolate-y goodness that you need for Valentine’s day. 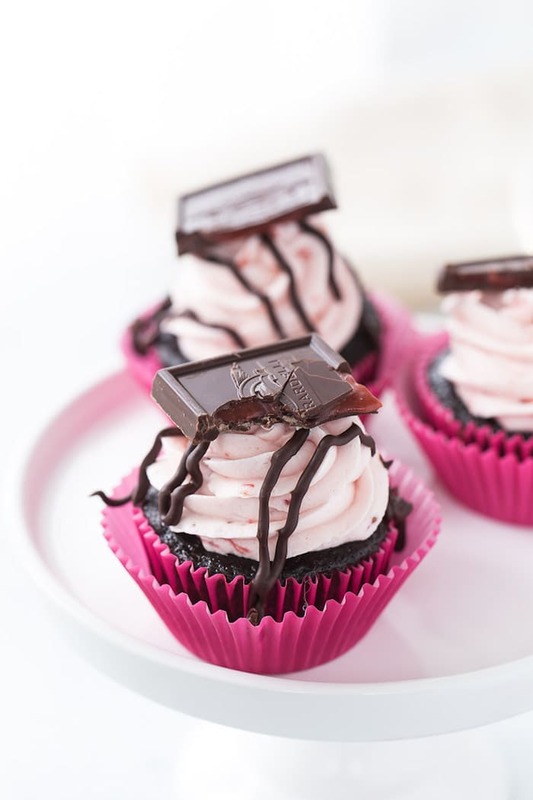 These decadent dark chocolate cupcakes are topped with a whipped fresh strawberry frosting. Preheat oven to 350 degrees F. Line muffin tins with cupcake liners. Sift together all the dry ingredients in the bowl of an electric mixer. In a medium bowl, combine all the wet ingredients using a whisk. Mix the dry ingredients on low speed for 1 minute. Stop the mixer and add the wet ingredients. Mix for 2 minutes on medium speed and scrape the sides and bottom of bowl. Mix for additional minute on medium speed. The batter will be thin. Divide evenly among the cupcake liners. Bake for 12-15 minutes or until a toothpick inserted in the center comes out almost clean. Cool cupcakes on wire racks completely. Meanwhile you could start on the frosting. To make the strawberry compote: bring 1 cup fresh strawberries (hulled and chopped), 1/4 cup sugar and 1 teaspoon lemon juice to a simmer. Cook on low-medium heat for 3-5 minutes, until strawberries softened and compote starts to thickened. Remove from heat and let cool COMPLETELY before using in frosting. Whip butter on medium speed for about 2-3 minutes in the bowl of a stand mixer fitted with the paddle attachment until light and creamy. Add the powdered sugar, vanilla extract, salt and heavy cream and mix on low for 1 minute until combined. Increase speed to medium-high and whip for 2-3 minutes. Add in the strawberry compote until mixed in. 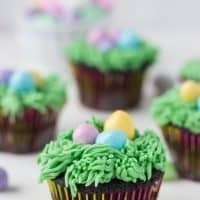 Frost cupcakes and decorate with chocolate drizzles. 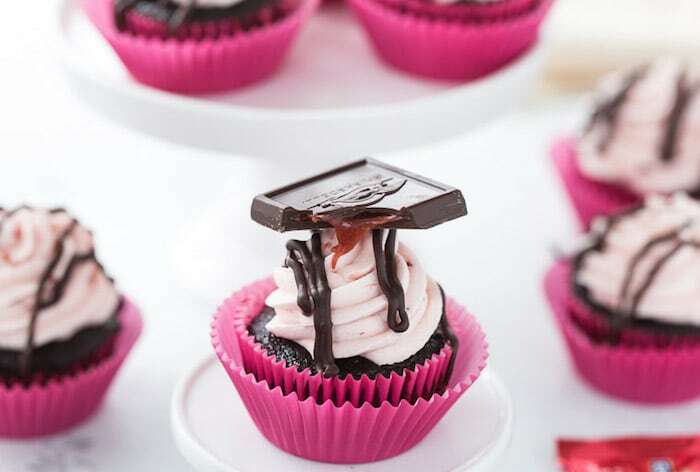 The hot coffee in the cupcake recipe brings out the richness of the chocolate. However, if you do not want to use coffee, use 1 cup hot water instead. 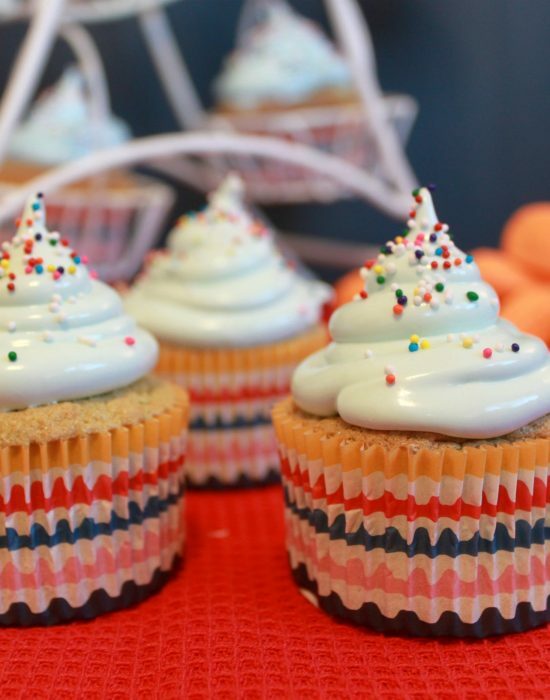 Ooh…these look delightful! The chocolate strawberry variety is actually my favorite from Ghirardelli – I wish it weren’t a seasonal item! I just picked up a bag at the store the other day, though, so I should be all set to whip up a batch of these beauties 🙂 Happy Valentine’s Day! Thanks!! And yes, I always get extra of these special edition releases to last a little longer in the year. I LOVE your new design — it’s just beautiful! Lindsay is currently working on mine and I’m so excited! These cupcakes are so pretty and I’m loving that fluffy pink frosting! Where’s the recipe for the strawberry compote? Mindy, the compote recipe is now in the directions. Please let me know if you have any questions! Beautiful and no doubt really yummy! I made the recipe for the chocolate cupcakes yesterday. They came out amazing! I didn’t use a mixer to blend, just hand mixed. Baking time in an electric stove was 16 minutes. They came out perfect. 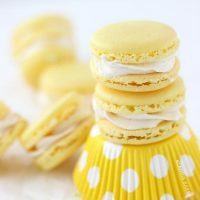 I topped them with a banana frosting… 1 stick of room temp (warm) unsalted butter, whipped, then sifted in two cups confectioners sugar, whipped again (hand mixer, many minutes! 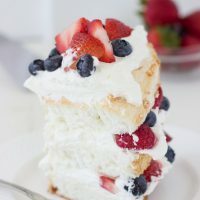 ), then added in a teaspoon (generous) of banana flavoring, and few spoons of homemade whipped cream (heavy whipping cream, stabilizer, confectioners sugar). Frosting on, yellow sprinkles, crystal sugar sprinkles, and a Nilla Wafer on each. 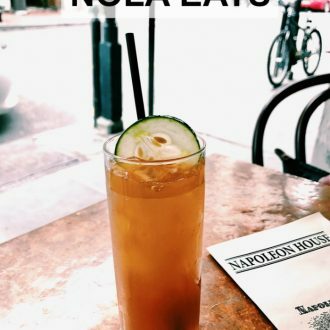 Omg… yummy! Omg Dawn that sounds amazing!! do you have a picture?? I would love to see them if you have them posted on Facebook or Instagram, feel free to tag me as @blahnikbaker. Thanks for leaving a review! 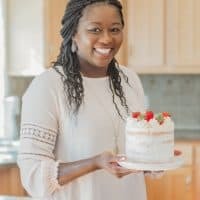 Hi Zainab, Can I use whole milk instead of heavy cream for the frosting? 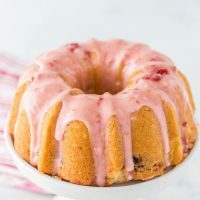 Another question – why do you use All purpose flour in some cupcake recipes and Cake flour in some? Hi Silpa! I love questions. In some recipes, I use all purpose flour and in others cake flour. they are not interchangeable because of the protein content and they yield different textures of cakes. So always look at the recipe to see which flour was used as that is the flour I used to test it and know works. If you do decide to interchange them, know that your results may be different from mine. I hope that helps. Lastly – can I leave this fresh fruit compote buttercream outside for 2 days? Sorry, am baking these for a sale so want to make sure they stay fine. Thank you so much for your response. 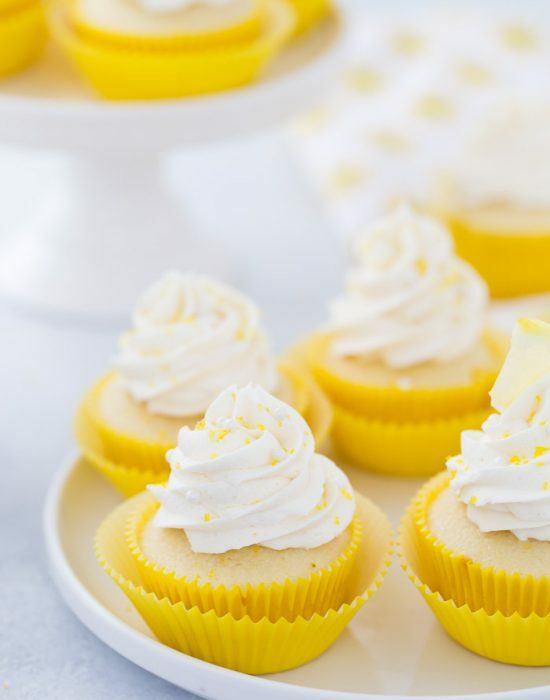 I want to let you know – I have tried several of your cake and cupcake recipes starting with lemon coconut one for Easter. They all turn out so good. Thank you once again for the wonderful recipes. That’s great to hear Silpa! Feel free to reach out anytime.